Whenever I talk about the Middle East I get lambasted. And when I fail to mention Israel or Palestine I get lambasted because I didn’t. Pro-Israeli listeners brook no criticism whatever of what Israel does. Supporters of the Palestinians recognize the legitimacy of nothing else. Sometimes you can’t please everybody and sometimes you can’t please anybody. So, OK, here goes. I just got back from Chicago where I attended a national meeting of political scientists. One of them described at length the local, national and international barriers to doing anything about climate change. His basic point was that those whose livelihood seemed to depend on activities that are bringing on climate change are strategically placed to prevent the rest of us from doing anything. His point is that to make anything happen it would be necessary to make people come to think about what they are doing as wrong in the teeth of evidence that it is good for them in their own lifetimes. That also makes them totally resistant to the idea that climate change is happening, that human activity is a substantial cause of the change, that it will do any damage and that it is worth dealing with. Ouch for the rest of us. Then I attended a meeting where the speaker described the change of ideas. He regarded those changes as inexplicable. For most of human history war had been considered noble, a good thing, that made people stronger and better. Then just before World War I, that started to change. After that war, no one makes claims about the generic benefit of war – war has become an occasionally necessary evil, but not a good thing. And for most of human history, people had slaves. Those that could would. Slaves and slavery were valued. It made you a big shot, and made your life easier. Then suddenly in the eighteenth century it changed dramatically in Europe. England began to block the slave trade and shortly it was banned in Latin America, the serfs were freed in Russia, and only the U.S. clung to slavery of the modern nation states. In the speaker’s description, both ideas turned in reaction to novels that separately described war and slavery as disgusting, as indeed they are. In regard to war, the novel described the scene of rotting and dismembered corpses on a battlefield. In the case of slavery, another novel described the brutality of the way slaves were treated. Both of course were accurate. The facts, however, were not new. What was new was disgust. I’m no novelist but global warming is disgusting. Global warming is an extinction of ourselves. We and our children and children’s children will be strewn on nature’s battlefield gasping for water and air, our bellies distended for lack of food, our homes lost to the elements, our skin alternately burned and frozen, unable to protect our children, wives, husbands or parents, indeed some will become too desperate to care. Global warming will take everything from us that makes us human. It has been doing that piecemeal in the aftermath of storms that have left people totally destitute in parts of the world. It will exceed our capacity to put people back on their feet as the oceans take back the coasts. It will poison us, as a warming climate spreads diseases for which we have no defenses, leaving us to rot from diseases few of us have seen and none of us care to see except as the noblest of doctors and nurses. It will extinguish our food supplies and it is attacking the supply of the air we breathe. Global warming is disgusting. Pass it on. — This commentary was broadcast on WAMC Northeast Report, April 8, 2014. Ever notice that I frequently talk about economics. What’s a lawyer doing talking about economics? I did read and study economics but there are other reasons why economic issues are dear to this heart. Lawyers do lots of different things. But for many of us, law is a helping profession. We work with people who are headed for bankruptcy and other events that will turn their lives upside down. We do our best to help them avoid personal tragedies – or pick up the pieces. We don’t think of clients as numbers but as people, most of whom we like and respect. We learn not to think of financial reverses as a judgment about their character, decency or personal value. It happens for all sorts of reasons, often beyond our clients’ control. When it is a mistake, it is often a part of learning how to do business or operate in this world. Some of the world’s most successful people have been through bankruptcy. Up close and personal, we care. So the national recession wasn’t just a set of numbers for me. It was a catastrophe in the lives of many people. They were passengers on the national ship on a foggy night when the captain crashed into another vessel. Millions of people went overboard, leaving their jobs and belongings behind. Rescuing people isn’t a choice; it’s an obligation just as it was not optional whether to pick our friends up from the wreck of the Achille Lauro. An S.O.S. has a clear and obligatory meaning. But there is another reason. One could trace it to a famous French aristocrat who visited and wrote about the U.S. in the 1830s but statistical studies beginning after World War II keep making the point that poverty and inequality are both hostile to the survival of democracy. Historians studied the failure of democracies on multiple continents and reached the same conclusion. Others with different methodologies keep reaching similar conclusions. It’s not a surprising conclusion. During the Great Depression in the 1930s, many were worried that we would lose our system of self-government, and some advised President Roosevelt to take dictatorial powers, but he refused. Now science has come to support common sense. Poverty can be dangerous, not only to individuals but to society. It makes people desperate and when they are, all bets are off. With that knowledge, it is painful to me to watch Congress leave the victims of corporate shenanigans in the dirt as if they were so much trash. And as an attorney, it is particularly painful to me to watch the U.S. Supreme Court under Chief Justice Roberts doing everything in its power to play the role of the Sheriff of Nottingham, robbing from the poor to pay the rich. Many of those decisions are complex legally as well as economically but their effect on the fairness of the contracts we sign daily and on the lives of many people are extensive and often tragic. 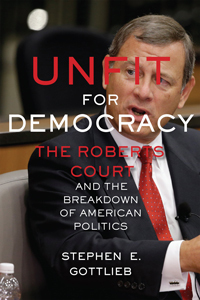 To me, the Roberts Court is threatening our democratic patrimony. The personal suffering would be enough. The risk to our country is hard to bear. — This commentary was broadcast on WAMC Northeast Report, April 1, 2014. You are currently browsing the Constitutionalism and Democracy blog archives for April, 2014.